Your computer's internal IP (Internet Protocol) address is a unique number assigned by your router. Each device on your internal network (LAN or Local Area Network) receives a unique IP address. This ensures that incoming data is sent to the correct device. There are many different ways to figure out what your computer's internal IP address is. One quick method is to open a Windows command prompt and then use the command line tool ipconfig. The following steps will show you how to find your IP address using this method. 1. Click on the Start icon. Your Start menu should pop up. It will look similar to the photo below. 2. In the dialog box type cmd. 3. Click on cmd.exe which should be listed near the top of the menu. 4. In the Windows command prompt (black window with white text) type ipconfig. Then press enter. 5. You should see a list similar to the one below. You should note that your router's internal IP address is also listed here. 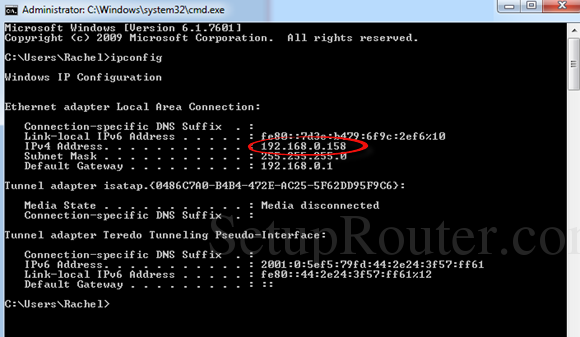 Windows identifies your router as the Default Gateway. My router's internal IP address is 192.168.0.1. The first three parts of your computer's IP address should match the first three parts of your router's internal IP address. How do we know this? All webservers know your external IP address; it's how they send pages to you when you browse the web. They learn your external IP address when you ask for a page. All we are doing above is sending that number back to you so that you can see it. To learn more about what an IP address is, visit our networking guide. For more info about what a router is visit this guide. For detailed information about your specific router visit our router guides.